It’s beginning to look a lot like Christmas! Well the home grown trees are cut and ready for sale, Holly and Mistletoe gathered and Wreaths made so the nursery is looking very festive. We have decorated the shop and put together a lovely display of gifts too. I really enjoy the run up to Christmas and all that glitter that goes with it. With this in mind I am looking at the plants that you can use for decoration in this month’s blog. Don’t forget also that you can still book on to Sara’s Wreath Making Course, further details here. Perhaps you can bring along cuttings from some of the plants we look at in this blog. 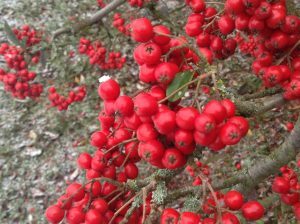 Cotoneaster ‘Cornubia’ – A very Christmassy plant which is covered in red berries which the birds, especially Thrushes, adore. It is evergreen but can lose a few leaves if we get a very cold winter. It is ideal for any soil as long as it does not sit wet during the winter and makes a handsome tree. It can be pruned to keep it under control or grown as a hedge. It makes quite a dramatic plant when grown against a wall where it can be trained to encourage flower and berry production. The berries last well when cut to be added to wreaths and it looks great added to table decorations. Hedera helix – AKA: Ivy. A beautiful native plant that really comes into its own at this time of the year. The lovely flower spikes have just finished and the berries are now swelling and are ideal to use in arrangements. I have some water pipes that are exposed in our kitchen and I always dress these with Ivy and Holly and some other evergreens and then hang baubles or orange segments from them, it looks great and is very simple to do. 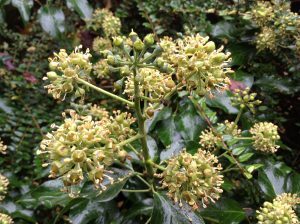 Ivy is a very useful plant in the garden as it will grow almost anywhere and is very good in those difficult areas such as dry shade. It can be used as ground cover or to grow up a very dark wall. This also creates good nesting sites for secretive birds such as Wrens. Skimmia japonica ‘Female’ – An evergreen shrub that is female. If you want berries you will need to get a male form as well such as Skimmia japonica ‘Rubella’. The latter also has handsome flower spikes in March and beautiful pink buds throughout the winter. These prefer a slightly acid soil and like to be grown in the shade so are ideal for that difficult dark corner on the patio or courtyard where they need to be grown in pots. This variety produces large fat shiny red berries that are generally too big for birds to swallow. They are very useful to add to wreaths and last for quite a while in arrangements. 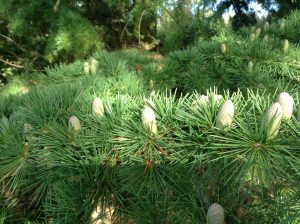 Cedrus deodara-Deodar Cedar– A very large statuesque tree that produces tiered open branches that weep slightly. Branches are covered in light glossy needles. This Cedar is not a tree for a small garden but it does make a bold statement if you have some space to grow it. Because of its lax habit on the new growth it is a good foliage for putting around the base of an arrangement or for draping over picture frames or along the mantelpiece. 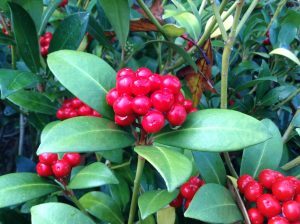 It combines well with Holly and Ivy and can be used in making garlands for draping over the banisters or around doorways. Ilex ‘Nellie Stevens’- AKA ‘Holly’. You cannot talk foliage for Christmas without mentioning Holly. This is not a form of our native holly but it is as good. I. ‘Nellie Stevens’ is hermaphrodite and so, unlike the native holly, you do not need separate male and female plants for berries. 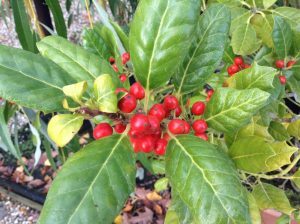 Like all hollies it is easy to grow and will tolerate all sorts of aspects and soil types. The only thing it dislikes is very wet soil. This plant is ideal for a wildlife garden or for that area of the garden where access is difficult. They are easily pruned to keep under control and grow very well in pots if you want to make a statement either side of a doorway. They need little attention except the odd watering to get it established. 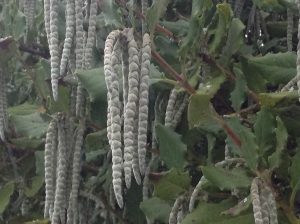 Garrya elliptica ‘James Roof’- AKA: Tassel Bush. Ideal for a shady wall or woodland garden. This lovely evergreen shrub produces long silvery-green catkins which can be up to 15cm (6”) in length. These appear now but will unfurl to release their pollen in early spring. These long catkins can be used in wreaths and other Christmas decorations and last very well. It is a large growing shrub but is quite slow and so takes a while to establish. It is quite an eye catcher when the catkins are fully extended and will tolerate a cold position which makes it ideal for a north facing wall. 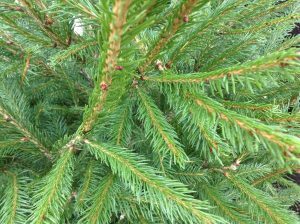 Picea abies – Norway Spruce or ‘Christmas Tree’. The traditional tree that we decorate with baubles and other festive paraphernalia. There is something about the smell that this tree releases (that lovely resinous fresh smell) in the house that just says Christmas. If you buy one with roots then you can keep it from year to year as long as you look after it. For a cut tree it is essential that you sit it in a container that you can keep topped up with water as they lose a surprising amount over the Christmas period and will drop their needles if allowed to dry out. The ready-made metal tree stands with 3 or 4 feet are very useful and have a water reservoir built in. The screws in the neck help to keep the tree steady when screwed in to the trunk. Which is useful if you have a dog or cat that like to tree climb!! Terracotta Pots– Now we are getting frosts at night it is a good idea to make sure that your terracotta pots are lifted off the ground with pot feet. This reduces the risk of the pots cracking and flaking. Fruit Pruning– Apples and Pears have dropped their leaves and so now you can see the outline of the branches. When it is not frosty you can prune them to encourage more fruit next year and remove anything that is diseased or rubbing. Try to get a nice even shaped tree with plenty of air movement around the branches which will help to reduce disease attack next year. Always cut to an outward facing bud to ensure you reduce the risk of rubbing branches. Happy Christmas to all our customers and all those who have visited the garden over the past year. Thank you for your custom and we look forward to seeing you around the Plant Centre next year.